Have you ever tried to make a gingerbread house from scratch? I’ve spent many holidays decorating gingerbread houses, and a few attempts at making the gingerbread house’s actual house, too. All of them fails in the stability department (but, pretty delicious fails). Eventually, we took the easy route and started buying one of those pre-baked kits, but added extra decorations. Particularly, the decorations that tasted the best. What can I say…I’ll take any excuse to buy candy. Except, gingerbread house creativity was never my strong suit. After a few years of the houses looking pretty much exactly the same, (I mean, what else CAN you do with jelly beans besides turn them into a string of Christmas lights!?) making the gingerbread houses kind of fell by the wayside. But, that doesn’t mean the flavor of a gingerbread house has to, too! If you’ve ever checked out any of my other recipes, you can probably tell I very much prefer chewy, gooey goodies, like my Eggless Edible Cookie Dough, Samoa Cookie Bars, and Chocolate Fudge Rounds Sandwich Cookies over crispy, crunchy ones (though, I’m trying to expand my palate! :D). 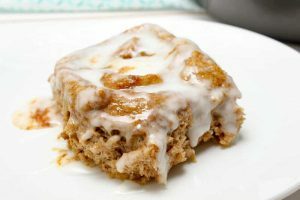 And these Whole Wheat Gingerbread Cinnamon Rolls fall right into that category – sweet, ooey, gooey center with soft, pillow-y, (and whole grain) doughy exterior. So, first we’ve got to talk about the filling. It’s creamy. Almost nut butter-y consistency. It’s perfectly sweet without being overpoweringly sweet, thanks to the molasses. It basically tastes like gingerbread cookie dough. 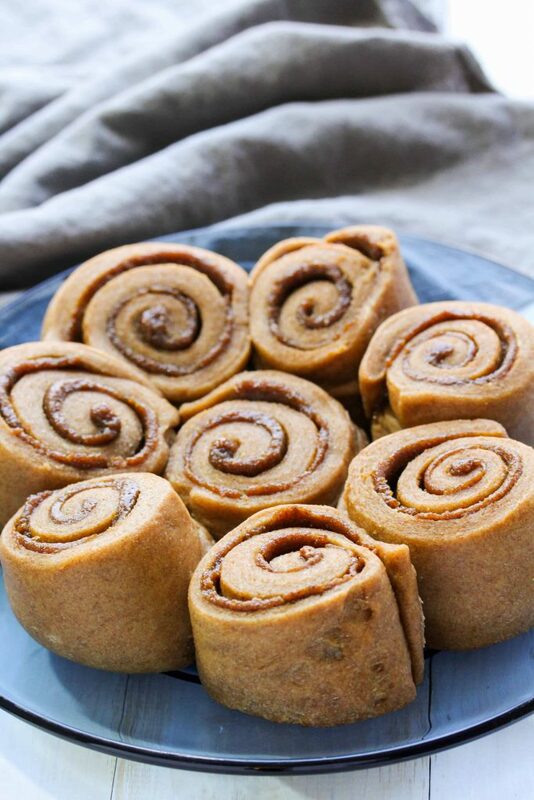 And when it’s baked inside the deliciously fluffy whole wheat rolls, it makes the inside extra gooey. 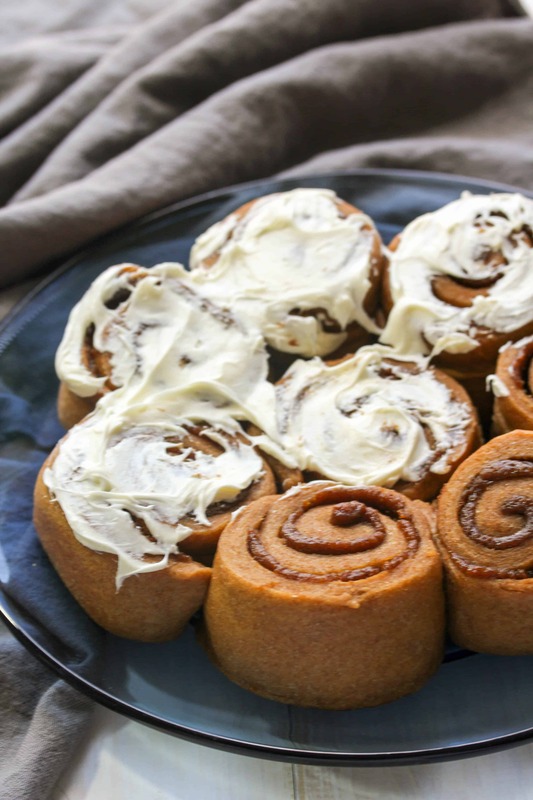 And let’s be real, whose favorite part about a cinnamon roll ISN’T the tight little curled up middle. 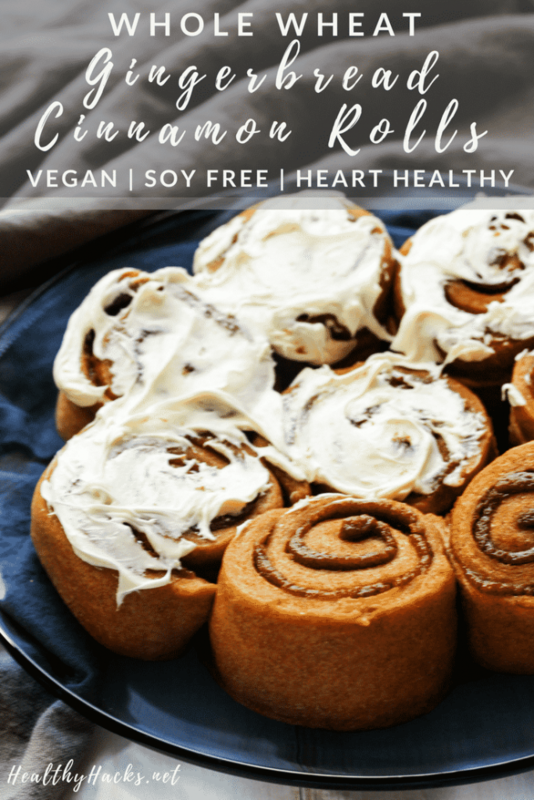 So, if you’re looking for cinnamon rolls to make for Christmas morning, or any other day of the year really, these rolls are meant for you! Besides being full of whole grains and fiber, they’re also packed with healthy fats from the nuts, and vital vitamins and minerals from the molasses. And if you choose to use dairy milk, you’ve got added protein and calcium. I mean, it’s practically a well-balanced meal….kinda. 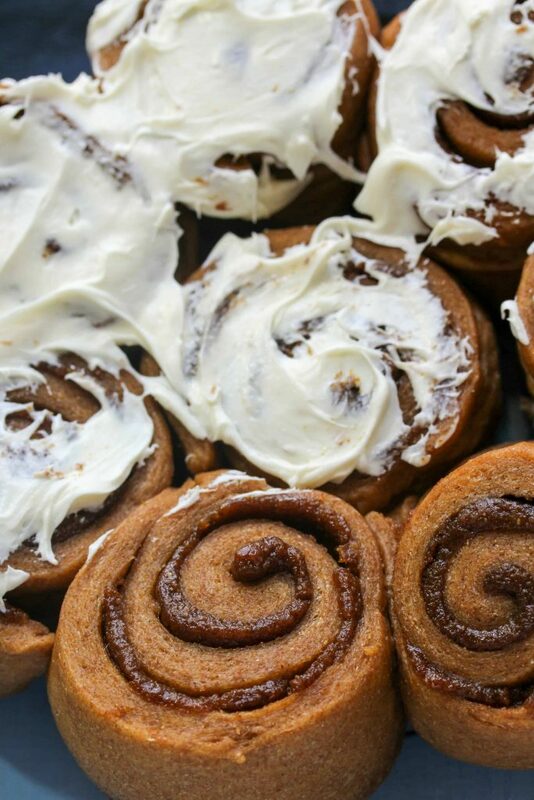 Even if a more balanced meal is if you’ve got one gingerbread cinnamon roll in each hand. For the rolls: warm the water and milk to 105 - 100 F (If you don't have a thermometer, read about my trick to get the perfect temp here ). Add the yeast and 1 tsp of sweetener to the warm liquids. Allow the yeast to proof for about 5 min. It should get frothy and bubbly. If not, do not continue with that yeast! In a large bowl, add the flours, sweetener, and salt and whisk together. Cut in the almond butter to the dry ingredients. You can do this with a pastry cutter, the tines of a fork (my fave way), or your hands. You want to incorporate the almond butter into the dry ingredients as much as possible. There shouldn't be any large clumps of the butter. Add the yeast mixture and the molasses to the dry ingredients and mix to combine. Once everything is pretty well incorporated (there should still be a little bit of dry flour left. The dough shouldn't be too wet) turn it out onto a floured surface. Knead the dough using the heel of your hand until the dough is smooth and not sticky (about 100 kneads should do it). Grease the bowl used to mix the ingredients and place the dough back in the bowl. Cover with plastic wrap or a clean towel and place the dough in a warm, draft free place to rise (I like to put mine in the microwave...not turned on obviously ;)) until it almost doubles in size. This usually takes about an hour depending on the temperature of your house. For the filling: once you're done making the dough, bring some water to a boil (enough to cover the cashews). Add in the cashews and let them sit to soften. Once the dough has risen, continue to make the filling. Add the softened (and drained) cashews and the oil to a food processor or blender. Whizz them up until smooth. Add the mnolasses, and blend again to incorporate. Then, add in the sugar, cinnamon, ginger, and salt and blend to combine. The filling will be a similar consistency to a nut butter. On a lightly floured surface, turn out the dough and roll it out to about an 11" x 9" rectangle. Starting at one of the long sides of the dough, begin to roll the dough up tightly. You want to avoid loosely rolling the dough or you'll get gaps in between the curls when the rolls bake. Using a piece of thread, cut the dough into 8 equal sizes. The thread method can be done by sliding the thread underneath the dough, crossing the thread overtop of the log, then pulling on each end of the thread so that it goes through the dough and makes an nice clean cut. But, you could also use a knife (the edges just aren't as clean). Place each roll into a greased pan (either an 8"x8" square or 8" round cake pan will work), leaving a little bit of space between the rolls. Cover the rolls again and place them back in the warm, draft free spot for a second rise. They won't double in size, but will get slightly puffier (which will take about 30-45 min). Once your oven is heated and your dough risen, bake the rolls for about 12-15 min. or until the rolls are slightly golden on the top, but the sides are still soft and springy. If you bake them until the sides are firm, they will have more of a dinner roll texture on the outside, but will still be soft and gooey on the inside - if you're into that kind of thing. 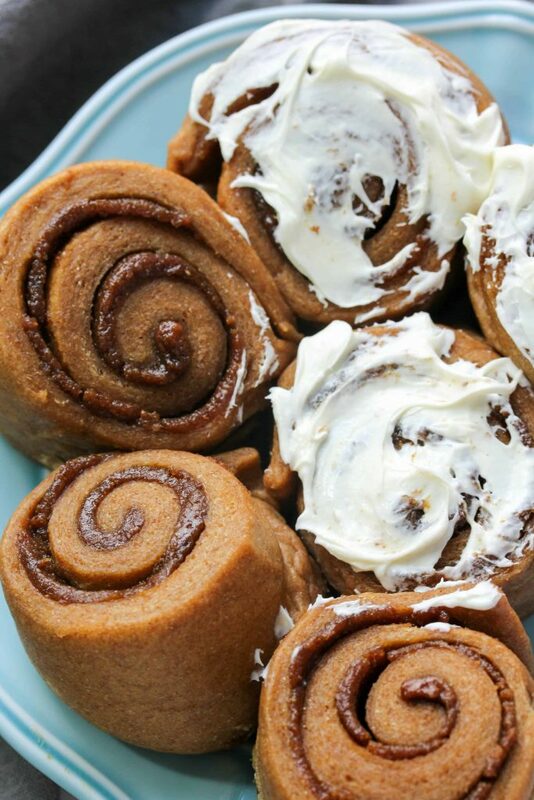 While the rolls are baking, make the frosting. For the frosting: in a large mixing bowl, cream together the cream cheese, sugar, yogurt, milk, vanilla paste, and lemon juice. 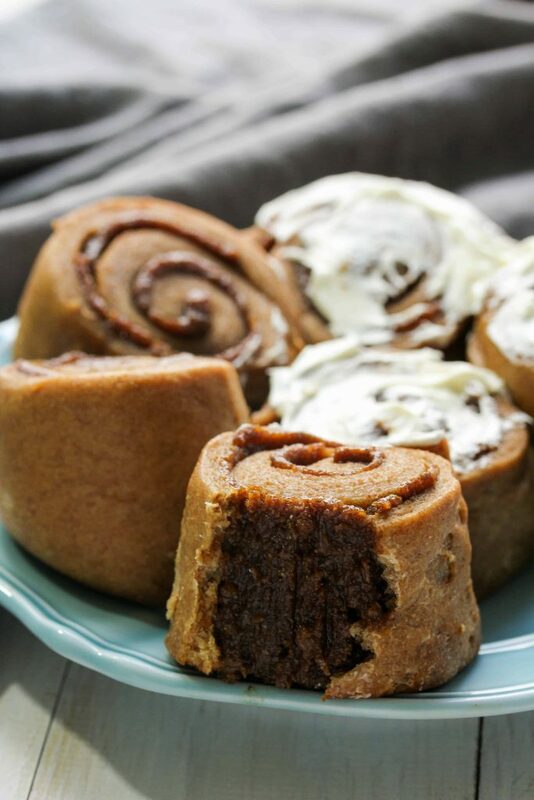 Allow the rolls to cool slightly before slathering the frosting on top and then digging in! They're definitely best warm or eaten on the same day they're baked, but will store in the fridge well for a few days. Prep time doesn't include the time for the dough to rise. Oh no! I'm sorry that happened! Did you knead the dough enough? Kneading yeast dough makes it light and airy. OMG. Kaylie, These look amazing!! Can the almond butter and cashews be subbed for anything? 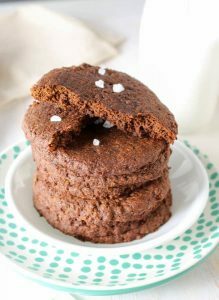 What can I use instead of brown rice flour in the frosting? Oat flour or regular AP flour should work too.